Today marks the forty eighth year that Malaysia has been independent from the British empire. It is a momentous occasion that is celebrated throughout Malaysia with parades, fireworks and parties. I thought I will share with all of you some pictures I took of the hisbiscus, Malaysia's national flower in different colours. I love Japanese food and it's always my default choice for dinner, if possible. One of my favourite spots is Rakuzen at Subang Jaya which is tucked away in some obscure shophouse. Besides this outlet in Subang Jaya, the same management also runs another Rakuzen in Chulan Square and Zen in Sunway Pyramid. We get pretty decent Japanese restaurants here as we have a large community of Japanese expatriates who are seconded over to work in Japanese companies. In certain areas near their work area and homes, there are Japanese restaurants everywhere. Subang Jaya is one area that has quite a few Japanese outlets as this place is quite near the Japanese factories in Shah Alam. It took us a while to search for a table that we were satisfied with that gave good lighting; the ones downstairs were too dim but the upstairs tatami rooms were just perfect with their halogen lights. We ordered a Spider Maki that has a deep fried soft shell crab for starters. I notice the sushi counter is always busy with requests (it takes quite a while to get this) as everyone seems to order from it. The last time we were here, we had their famous Dragon roll with prawns and avocado which I thought was so so. 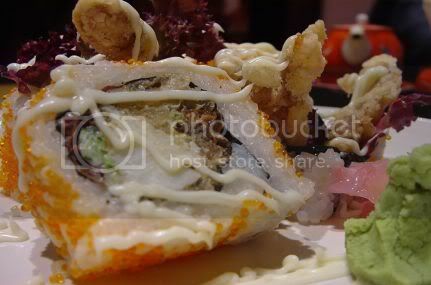 This Spider Maki was much nicer and tasted oh so good with the crunchy soft shell crab. Splashie Boy wanted something light that night as he had a heavy lunch so he opted for Niku Soba noodles. 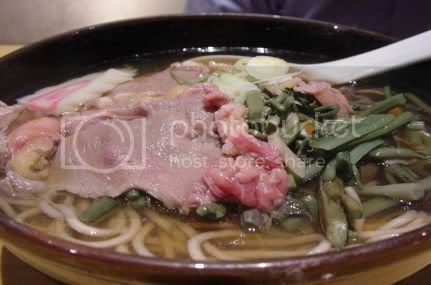 The noodles came with thinly sliced tender beef, mountain vegetables (sansai) and nameko mushrooms in a flavoursome dashi broth. I had a bit of the broth and it was yummy. I love sashimi and sushi rice where they have mixed rice vinegar into cooked short grain rice. 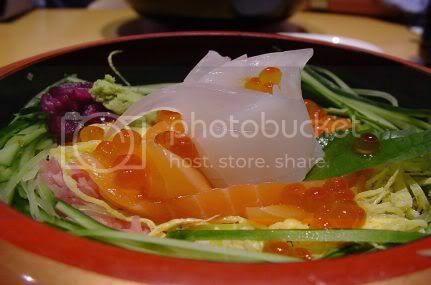 One of all time favourite dishes is the Chirashi Sushi where they have assorted sliced raw fish on top of sushi rice. Rakuzen has this unusual Chirashi called Hokka Chira Don which has slices of raw salmon, salmon roe, cuttlefish on top of sushi rice which has been sprinkled with sliced pickled ginger (gari), sliced omelette and sliced cucumbers. Simply heavenly stuff and so far, this is the only place I know that serves this combination. Although it was a weekday, the place was packed and the tatami rooms upstairs were full. A well worth trip all the way to that part of town for some yummy Japanese food. Now, I must try and persuade Splashie Boy to try their KL outlet which I reckon is nearer to my place! Linda from At Our Table has come up with this month's theme and it's all about frying! Wow, what a wonderful excuse to get down and dirty with lots of oil. I was a bit stumped this time around as there was so many fried items to choose from. Arrgh, decisions, decisions! Eventually after a few changes, I decided to cook an entire meal based on the different types of frying methods i.e. deep fry, pan fry and stir fry. To kick off my fry up menu, we had pie tee shells with a seafood filling. Pie tee is actually a popular Nyonya food item and is served in restaurants as an appetiser or a snack. The shell is made from a rice flour batter and deep fried until it is crispy. It is also known as "tophats" as some make the shell with a brim which resembles a tophat. I have yet to achieve the tophat look and will have to keep practising till I get it right. There is a special pie tee mould with a long handle so one can dip it in the hot oil before coating it with the batter. Once coated, it is dipped back into the hot oil to cook until crispy. To achieve the top hat brim, one must tap the mould lightly on the side of your pan so the top expands a bit. This tapping also helps you to remove the shell from the mould later on. For my pie tee shells, I used an Amy Beh recipe which is available on the Kuali website. I found that in the beginning when I started making the shells, they came out too thick but gradually after doing a few, my shells got crispier and better. In fact, I made two batches as the first batch had a slight accident when one overzealous ginger kitten decided he would make it his meal. When I realised that the kitten was sniffing the plate, I shouted at it and the whole plate toppled and the crispy shells were all crushed. Usually the filling is made from shredded turnip or yam bean and garnished with shallot crisps but I wanted something different so I whipped up a seafood filling. Originally. I wanted to add fresh scallops to the filling but on Friday when I was at the supermarket, the scallops just did not look fresh so I switched to some baby clams. I just stir fried some chopped garlic in oil, added some peeled prawns, the baby clams and some dried scallops which I had soaked in hot water. These were dry fried with a dash of soya sauce and shaoxing wine added for flavour. Once it is cooked, I stirred in some chopped macadamia nuts and pan fried pine nuts to give it a nice crunch. 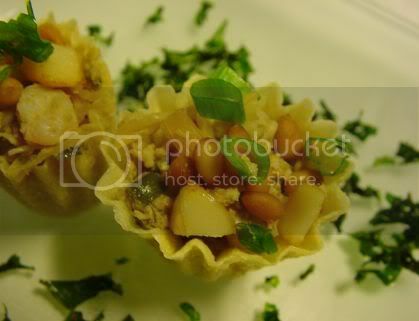 You will need to cool the filling first before adding it to the shells. Sprinkle with some chopped spring onions and serve with your favourite chilli sauce. The pie tees was sweet with the seafood filling and great to start the meal. For the main course, we had salmon which I chose to pan fry with a slight twist. I have read about unilateral cooking method where you cook the food only on one side hence I was curious to try it out. 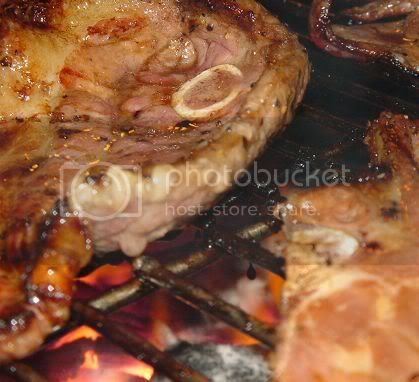 The concept of this type of cooking is, the bottom especially the skin is hot and crisp, the middle warm and just cooked while the top is still raw. Inspiration for this recipe was from Flavours, the magazine who originally got it from Chef Martin Aw Yong, The Regent Hotel Kuala Lumpur. Although the original recipe added a curry dressing, I had omitted it in my version. In order to ensure the temperature of the salmon does not fall further once you finish pan searing the salmon, you need to top it with the chopped spring onions and the tobiko caviar before you start cooking it. 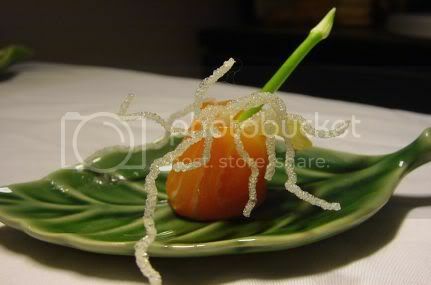 To garnish the top of my salmon, I added some spring onion flowers. 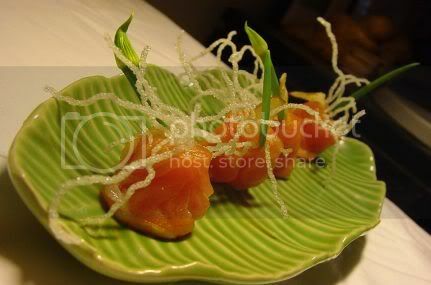 I also deep fried thinly sliced kai lan and sprinkled them around the salmon as my vegetables for the night. 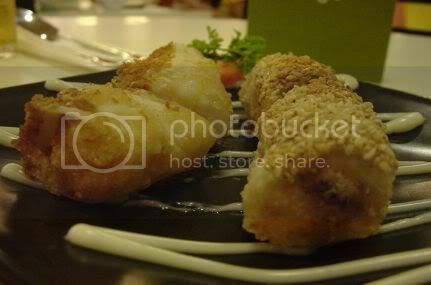 This was my favourite item on the menu as the salmon was wonderfully tender and I liked the crunchy skin at the bottom. For the paprika creme fraiche, mix together 25ml of creme fraiche with 1/4 teaspoon of paprika powder. Season the salmon with 1/4 tablespoon olive oil, salt and pepper. 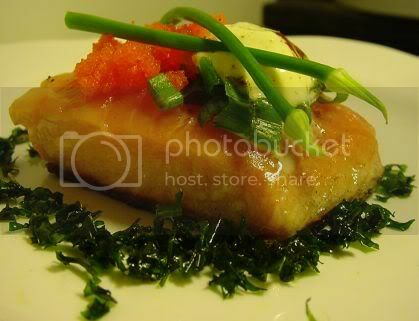 Top the salmon with the chopped spring onions and tobiko caviar. Heat up a frying pan until moderately hot. Brush with remaining olive oil. Sear the bottom side of the salmon until it is crispy and golden brown. Cook the salmon until changes colour up to about three quarters of it's height. The top should be barely cooked. Remove from pan carefully to a warm plate. Add a dollop of paprika creme fraice and garnish with spring onion flowers. 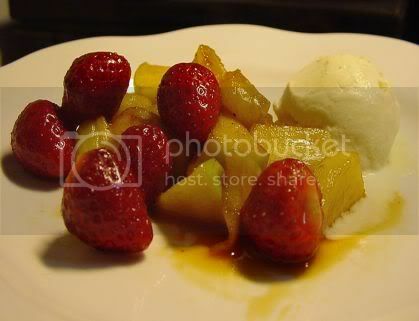 To round up the menu, I gave dessert a new perspective as I stir-fried my cut fruits to give it a nice browned edge. It was drizzled with some sweet caramel and served with a sharp ginger ice cream. I borrowed this idea from my Restaurant Favorites at Home Cookbook by the editors from Cooks Illustrated. Making the ginger ice cream is so simple as it just meant stirring some ginger juice into plain vanilla ice cream. This was done a night before to allow the ice cream to firm up after it was mixed with the ginger juice. For my fruits, I used a mixture of Granny Smith apple, pineapple, honey dew and strawberry. The dessert was light and not too sweet with the addition of the sharply flavoured ice cream. Just a perfect ending to a light and satisfying meal. Grate the ginger finely. Transfer the grated ginger to a fine mesh strainer over a bowl. Use the back of the spoon to press down the grated ginger to extract as much juice as possible. Place the softened ice cream in a bowl and using a stiff rubber spatula, fold in the ginger juice. Cover tightly with plastic wrap pressing the plastic flus against the ice cream. Return to freezer for about thirty minutes to firm up. Steep the tea in boiling water for 5 minutes. Remove and discard tea leaves/bag . 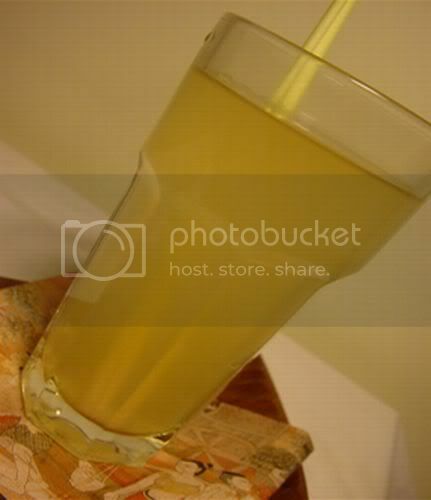 Stir in the honey, lemon juice and salt until dissolved and set aside. Measure 1/4 cup water into a small heavy bottomed saucepan, pour the sugar in the centre making sure it does not touch the sides of the pan. Cover and bring to the boil over high heat. 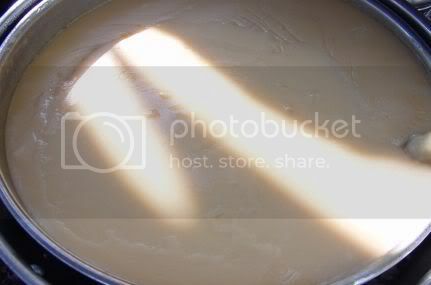 Once boiling, remove cover and continue to boil until syrup is thick and registeres 300 degrees on an instant read thermometer, approximately 6-7 minutes. Reduce heat to medium and cook syrup till it turns light amber, about 1-2 minutes. Remove from heat and stir in the tea mixture being careful about splutters. Return to the heat and cook until syrup thickens, about 5 minutes. Transfer to a small bowl and mix in the Grand Marnier/orange juice and set aside. Heat vegetable oil in a skiller over medium high heat until smoking. Add the apple, honeydew and pineapple. 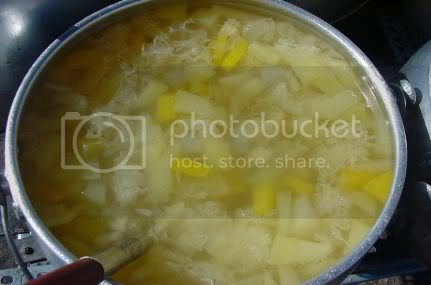 Cook, stirring frequently until the fruit is lightly browned around the edges. Remove from heat and stir in the strawberries and the jasmine tea caramel. Serve with a scoop of ginger ice cream on the side. Thanks to Linda for hosting and one will wait with bated breath for the round-up of wonderful entries. It's the weekend (ta da!) and cat blogging time. If you want to share pictures of your lovely kitties, just leave me a comment with your permalink! and add a "weekend cat blogging" tag to your post! This weekend, I bring you the Bollywood edition of WCB! I am not a great fan of Indian movies but I always remember them for their courtship dances around the coconut tree. Nowadays, they don't do that anymore but perform these slick choreographed dances ala Britney Spears. Let me introduce to your the stars of my show. Here's the male star of the drama, the ginger kitten who has invaded my home and wants to stay in it permanently. Like any male star, he is charmingly cute and always wheedling his way to your heart. 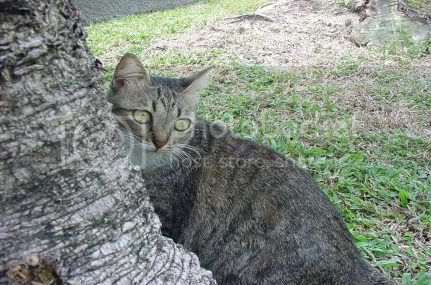 Then we have the shy but beautiful female star, Meow Meow who lives a sheltered and pampered life at home. Always a romantic, here she is pining for the one cat who will sweep her to the sunset. If he does not come, a big bowl of cat food will be perfect too. Unfortunately Meow Meow hates the ginger kitten whom she sees as a threat to her family's happiness. They were doing a little chase around the tree (not captured as my camera will take blurry pixs if the object is in motion) but here they are, where Meow Meow is doing the classic "go away" look. The ginger kitten is thinking to himself that she must have the hots for me since I am so cute and throwing me so much attention. Meow Meow giving the cold shoulder to the ginger kitten since snarls will not do! 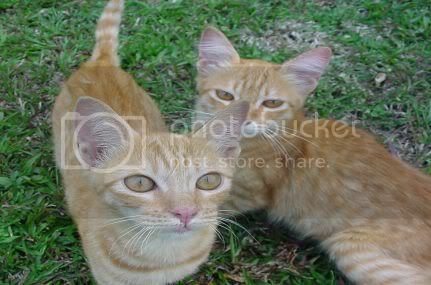 Ginger kitty thinking to himself, female cats are so mah kwai fan (chinese for complicated!). 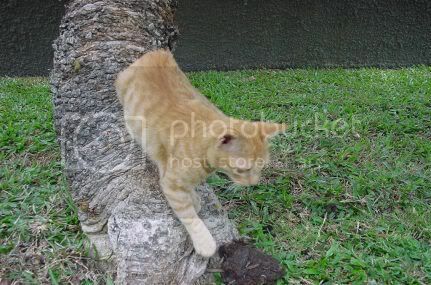 There are more fish in the pond that are cuter and less complicated than this cat, let me go look for some. Not sure if they will fall in love with each other eventually. Guess time will tell but so far, Meow Meow is tolerant towards the ginger kitten although sometimes, she can be quite bitchy to it. Ms. Beije joins us for the first time (all written by herself) from Pumpkin Pie Bungalow. I thought I'll share with you a picture of some lemang and ketupat daun palas I found at the farmers' market (Pasar Tani in Malay). Don't they look delicious and remind you of the forthcoming Hari Raya Puasa? Lemang is glutinous rice with coconut milk that is cooked in long bamboo tubes. These bamboo tubes are cooked using open air fire. Banana leaves are used to line the tube before putting in the glutinous rice soaked with coconut milk. 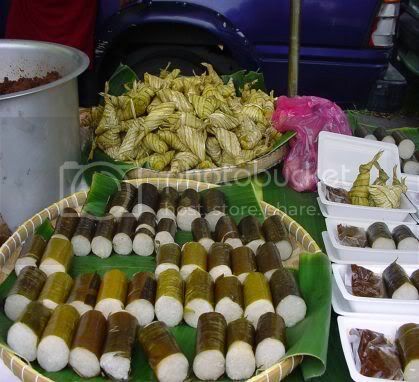 Although you can get lemang all year round (around the Karak highway and at farmers' markets like these), it is usually served during festive seasons like Hari Raya Puasa and Hari Raya Haji. During those festive times, you will see makeshift stalls popping up at the side of the road just before the end of Ramadhan (fasting month), where they will create a temporary site to burn the lemang. TV Smith has an excellent picture of one such stall using coconut shells as firewood. It's not easy to cook lemang and sometimes you get those which is overcooked. The lemang is served with rendang (as seen in the picture) which can either be made from beef or chicken. Rendang is a curry that is cooked with spices like lemon grass, galangal, cumin seeds, fennel seeds, dry fried grated coconut (kerisik) and coconut milk for a few hours. 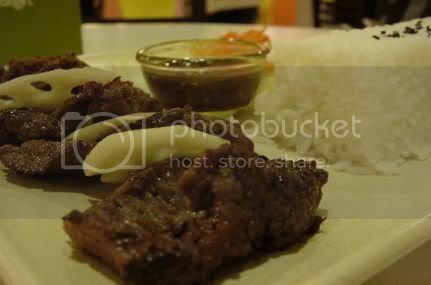 Usually made with beef cubes, it can also be made from organic chicken (ayam kampung). I like my lemang with serunding daging (spicy beef floss) that is cooked with coconut milk and spices. The best serunding in my opinion are the ones from Kelantan as they are so aromatic. Nowadays, you can get chicken and fish serunding. Another must have during Hari Raya is ketupat daun palas. These triangular parcels contain glutinious rice wrapped in palm leaves fronds called daun palas. I usually like them plain but some people do add black eyed beans. For an excellent write up and detailed pictures on how to wrap ketupat palas, do visit Farah Mahzdan's blog. I also learnt that depending on which gender you're giving the ketupat to, you fold them differently. After blogging about all these delicacies, I am really looking forward to Hari Raya Puasa as that is when I get home made ketupat daun palas lovingly wrapped and yummy rendang to go with it. We were invited to a pool party on Saturday night to celebrate one of Splashie Boy's 4WD friends i.e. Mr. Kokonut Soldier. Not sure how he got that call sign, anyone care to elaborate? I am sure there is an interesting story about it. The party was also to celebrate his daughter's birthday so it was in two parts; an afternoon tea party for the kids that started around 4 p.m. followed by the adults party from 7 p.m onwards. It was great to catch up with people as we have not seen them for quite some time. Splashie Boy has been busy with work during the weekends so he has not been doing much 4WD trips. It would not be a party without great food and we had lots to choose from; Kokonut Soldier's mother's famous Lam Mee with home made sambal belacan, roti jala with chicken curry, lettuce cups with sengkuang, mini pizzas, futomaki, french fries and etc. Fireman Ho was in charge of the barbeque and he was grilling all these yummy and succulent lamb steaks, chicken and sausages the whole night. I managed to get the low down on Fireman Ho's origins of his call sign when he confessed that he is a bit of a pyro-maniac since he loves starting bonfires and barbeques especially during those jungle trips. He has definitely perfected his barbeque technique as his grilled chicken (no bone and butterflied) was yummy while his lamb steaks were just cooked to succulent perfection. It was a fun night with Splashie Boy checking out Fireman Ho's latest gadget, the red-hot HP iPaq hw6515 with a built in Global Positioning System (GPS). Needless to say, he spent quite a bit of time playing with that gadget. Now, Fireman Ho cannot give the excuse that he is lost in the jungle since he has GPS! We also heard about their latest trip to Jerangkang where they went to look for a new camp site and almost met some elephants in the jungle. Of course there was car and tyre talk as usual including Fireman Ho's tyre puncture story on the way back from Jerangkang. We also had some Bollywood style Sri Lankan maid stories that had us cracking up. All in all, it was a great night! Thanks so much to Kokonut Soldier for inviting us. I had blogged earlier about tong sui when I made Leng Chee Kang at home but I thought I'll share with you this wonderful place I found recently. For those who are unfamiliar with tong sui, it literally means "sweet water" in Cantonese. Some have beans like red beans, green beans or barley which is boiled for hours so it's thick. 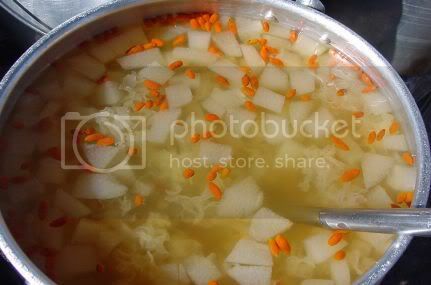 Others have ingredients like fruits, dried longans, snow fungus which is double boiled and served with a sweet broth that is cooked seperately. I stumbled on this little tong sui shop one day, when I decided to detour to Section 17 on the way home one evening. 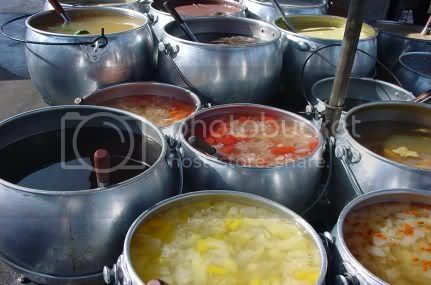 It starts business from 4.30 p.m. onwards for the evening and night crowd that eat at the Section 17 roadside stalls. I am so into tong sui these days as it's an ideal way to cool down during these hot and hazy summer days. I love the varieties this place has as they are not the usual things that you get at the tong sui place. 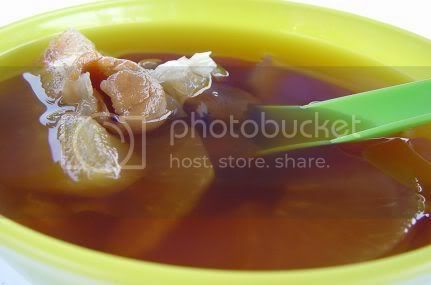 A bowl of tong sui will cost you RM1.20 which is so reasonable since it's quite a big bowl. You can opt to have it with ice cubes or not but if you don't, it will be extremely sweet. The stall owner serves his assortment of tong sui from these huge metal pots that have individual gas burners underneath them to keep the tong sui warm. You can serve yourself the tong sui or ask the man tending the stall to scoop out a bowl of your preferred choice. Here is the thick variety tong sui. 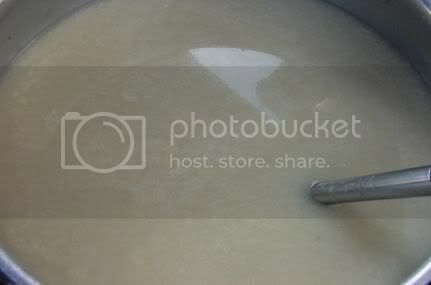 Not to sure what it is but it looks like Peanut Paste (Fa Sang Wou). It's a definite must for those who love anything to do with peanuts as they make this tong sui from peanut butter. This whitish tong sui is barley, bean curd skin (foo chok) and gingko nuts. Usually they boil the foo chok until it's all broken up so it's creamier. This stall has a variety of unusual tong suis which he has added fruits and vegetables like sliced pears, apples, watermelons and winter melons. They all look so pretty in their huge big metal pots as the fruits and white fungus have floated to the top. 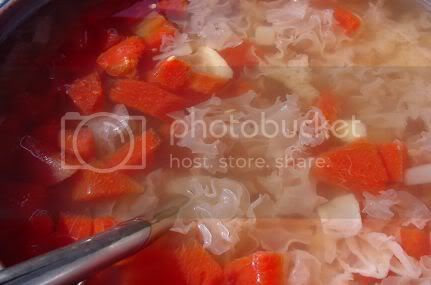 This one has sliced peaches, winter melons and white fungus in a clear broth. In this variety, the red bits are wolfberries (kei chi) that is a Chinese herb good for your health with slices of winter melon and snow fungus. This is my favourite picture, the red juicy watermelon chunks mixed with the flower like snow fungus. Some of the tong suis don't look so great in their huge metal pots so I thought I'll share with you the individual bowls which I had drank through out a period of time. This is an unusual one, it has dried figs (mo far kor), fresh sea coconut, barley and snow fungus. One of my favourites as I love the unusual combination. 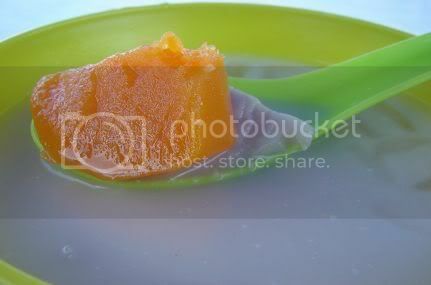 This is steamed sweet potato and taro in a coconut milk broth which we call bubur cha cha in Malaysia. In this stall, his coconut milk broth is quite watery unlike the Nyonya restaurants that serve it thick. I liked the orange sweet potato which was soft and fluffy. Some places even add bananas, sago pearls in their broth. 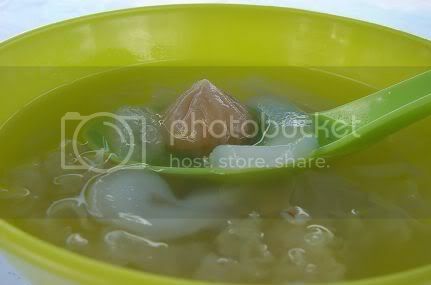 This is the sliced pear, longan and snow fungus tong sui. Very cooling but sweet unless you add some ice cubes to dilute it a bit. These pictures were taken over time as I usually have a different bowl of tong sui each time I pass through this area. Initially when I started snapping pictures, the owner thought I was a reporter. When I told him, these pictures are for myself, he was a bit dissapointed since he thought I would bring him more business. Yesterday when he saw me take pictures of my individual bowl of tong sui, he asked me if I was setting up my own dessert place. I told him nope but I wanted to take pictures to show my friends his lovely tong sui. He was quite happy and told me in typical China man fashion that no need to take pictures, just bring your friends to eat my tong sui. Starts from 4.30 p.m. onwards. If you come late at night say about 8 to 9 p.m., tong sui may be sold out as it's extremely popular. I read about this place from Suanie's blog and mentioned it to Splashie Boy in passing that there's a new place in 1 Utama with steaks. Hence on Friday, when it came down to choosing a place to eat, I got tricked in trying this place out. Originally I wanted Japanese food (my default choice) but that was vetoed out as he had Japanese for lunch. I offered Korean but he said no way, he would walk into a Korean joint and smoke out his precious BMW Williams F1 white shirt. So he offered a compromise and said, let's go to 1 Utama (this huge mall) and see what is there. I was all for eating at delicious cafe but somehow he successfully steered me to this Jack's Place claiming he wanted to see this new place. When we got there, he took a look at the menu and said, those steaks look good and next thing I knew, I was sitting in a table there. I must admit that this place does not look like those normal steak houses as they have a modern feel to it. Reading it's history (started in the 1960s in Singapore) made me associate it with the Ship, a local steakhouse popular in Malaysia. We ordered an appetiser to share since we knew the steaks will definitely be filling. The stuffed mushrooms with crab and lobster sounded appetising and looked interesting in it's little frying pan. However tastewise, I thought it was nothing great and a tad bit bland. By the way, can you see Splashie Boy's precious BMW Williams F1 shirt in the background? It's a bit blurry since the focus is on the mushrooms. Whenever I go to a new place, I usually ask the wait staff for their recommendations. The waitress that night said their Jack's special steak was their most popular item on the menu so I ordered that. It comes with white asparagus on top and shitake mushroom sauce. Sides are blanched broccoli and carrots with a huge baked potato. The difference between Jack's Place and the other steak houses in town is they serve these thicker cut tenderloins. Very juicy and almost melt in the mouth. Definitely nicer than the usual sirloin, rib eye cuts that you get in other places. Splashie Boy ordered the Garlic steak which came with lots of fried garlic. The nice thing about this place is they serve their steaks on the hot plate so if you feel your steak is a bit undercooked, you can sizzle it a bit on the plate. 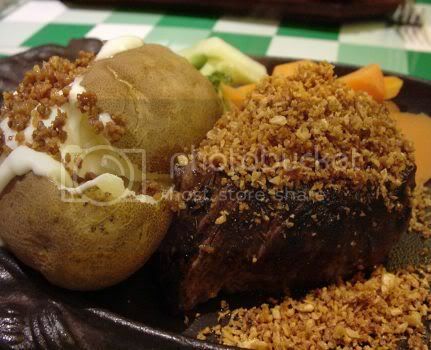 Vegetables are also not overcooked like most places and tastes fresh and crunchy. They also serve a pretty reasonable set lunches throughout the week (including weekends) for about RM13 for the chicken and fish dishes while the sirloin steaks are about RM18 in the lunch sets. Stephanie of Dispensing Happiness has posted the round-up for the first blog party. It was a small intimate affair but filled with yummy savoury delights, cooling drinks and luscious desserts. Go on over to check out those tasty bites and drinks that one must include in their next cocktail party. Look out also for September's theme and join in the fun of planning the next party. It's weekend cat blogging time, if you want to join us, put your link in the comments box and add the tag, Weekend Cat Blogging on your title. 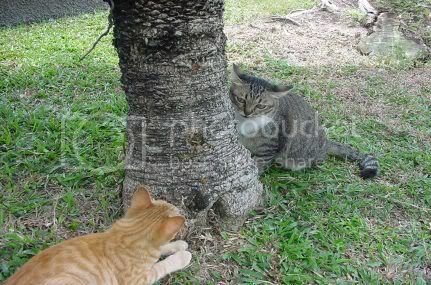 Remember those kittens who like to hang out at my house, which I blogged earlier? Well, somehow they have become an almost permanent feature as I have been feeding them. I am a big softy when it comes to cats and these ones are so cute that I can't resist. Meow Meow hates them and growls at the kittens whenever they go near her. I have been getting to know them quite well and could even distinguish each one. Sadly, on Tuesday I discovered one is missing and can't be found at all around the neighbourhood. Not sure what happened to it since there is no trace of it. I hope someone took it away and gave it a nice new home since it's the friendliest and cutest one with a fluffy ginger tail. It was also my favourite kitten since this cat seems to want to have human contact all the time. Sniff! Sniff! Thought I'll share my last picture I took of it with it's fellow kitten brother/sister in rembrance of a cute kitten. Lisa's studious kitty, Abe at Restaurant Widow. Stephanie from Dispensing Happiness suggested this Blog Party early August and I was thrilled to take part since I rarely do cocktail parties. I planned to kick off my party bites this week but somehow, everything got caught up in between and I was faced with Thursday looming ahead but no food! I rallied on Thursday and told myself that I must get this off since it's the inaugural round. So when, Splashie Boy told me that he could not join me for dinner since he had a late night conference call, I brushed it aside and said no problems, I will still continue even though I'm flying solo. I'm glad I perservered as I have some lovely cocktail bites and drinks to share with all now. Originally my theme was Thai bites but I added a Japanese twist to it since I could not resist some salmon sashimi I saw in the supermarket. Like all cooking events of mine, I always get a little crisis and this time the mayonnaise did not turn out (argh!). These fantastic looking salmon sashimi is extremely easy to make and tastes great with some home made mayonnaise. If mayonnaise is not your thing, try them with soya sauce and a pinch of wasabi for kicks. Inspired by my Flavours magazine which originally made them with beef sashimi, you can substitute the salmon with tuna if you fancy. The twistie bits are bean thread noodles that have been deep fried. It's amazing how they frizz up the moment you put them in the hot oil. 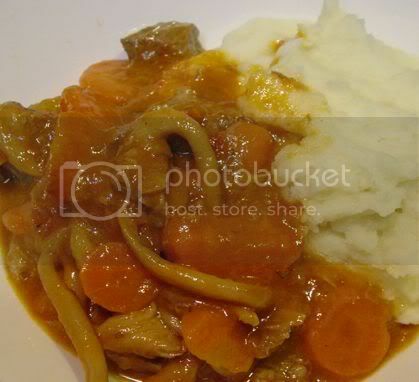 I have also added some shaved potato slices which have been deep fried and a flowering spring onion. Cut your dried bean thread noodles and the potato slice to a length of about six centimetres and deep fry them. Ensure you fry them seperately all else the thread noodles will stick together in a clump. Place on the salmon sashimi and roll them up. As every party needs drinks and since the theme was Thai bites, I decided to go for the iced lemongrass tea from Donna Hay. The drink was refreshing and added a nice Thai flavour. Place the lemongrass in a food processor and process until finely chopped. Place the chopped lemongrass and water into a saucepan and simmer for fifteen minutes. Add the sugar and set aside to cool. Strain and add the lemon juice. Bruise the extra lemongrass and tie each in a knot. Serve over ice with the lemongrass. Serves four. To conclude my cocktail menu, I made some spicy crab and prawn fritters with a chilli and lime dipping sauce from Australian Women's Weekly Best Food cookbook. Ever since I bought that cookbook, I have been eyeing that recipe but never tried it. This time round, I had a perfect excuse to whip those fritters. Extremely simple since it just means processing all the ingredients and shaping them into fritters to be pan fried. Shell and devein the prawns. Blend or process with crab, paste, egg, green onions, herbs and chili until just combined. Wet your hands so the mixture will not stick and shape them into fritters. 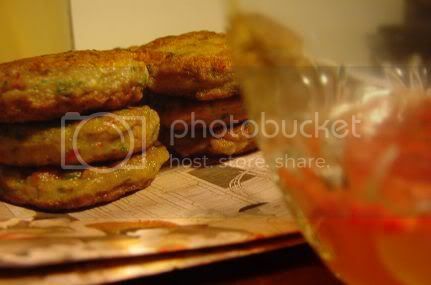 Heat up oil in a frying pan and cook fritters in batches till golden brown. Drain on absorbent paper to get rid of any excess oil. Serve with sauce. Place ingredients in small bowl and whisk until sugar dissolves. Keeping with the Thai theme, I used a wooden platter we had earlier purchased from the Damnoen Saduak floating market in Thailand. As I did not have any banana leaf, I improvised and used a Thai motifs wrapping paper from Jim Thompson, my all time favourite shop for Thai silk fabrics and what-nots. A big thank you to Stephanie for this wonderful idea to have a Blog Party and I can't wait for the other events plus the roundup of cocktail foods this weekend. Sorry about the late postings as I seem to have problems posting to Blogger this morning. I finished this post and when I published it, the connection hung on me and I lost all my data. The Hungry Ghost Festival is celebrated on the fifteenth day of the seventh month of the Chinese lunar calendar, which is 19 August this year. Usually the Cantonese will offer prayers to the ghosts on the eve before the actual date while the Teochews and Hokkiens celebrate on the night of the festival. A week before the festival date, there will be entertainment shows for the ghosts and the living that range from karaoke sessions, dancing and Chinese opera performances. Paper effigies and altars are also erected under temporary tents for people to pray and worship the ghosts. If you do attend any of these performances, never sit in the front seats as these are always reserved for the ghosts. For more on what the altars and the performances look like, please refer to Lilian from Malaysia Best who has excellent pictures on them. The celebration of this festival is from an amalgamation of beliefs of Buddhist, Taoist, Confucian and traditional religious teachings. The Taoist believe the soul has a yin element called the kui (devil) and a yang element called the shen (spirit). Upon death, the shen remains within the grave while the kui returns to earth to roam it. The Chinese believe heavily in filial piety which includes worshipping their ancestors' graves or else calamity with strike the family. If this is neglected, the kui is said to become a hungry ghost that will cause trouble among the living. The Chinese interpret the spirit world as a parallel universe to earth where the spirits enjoy food, money and material items just like we do on earth. Hence to appease these spirits and as a way to pay respect to our ancestors, food is served on altars and paper offerings are burnt to send them over to the spirit world. 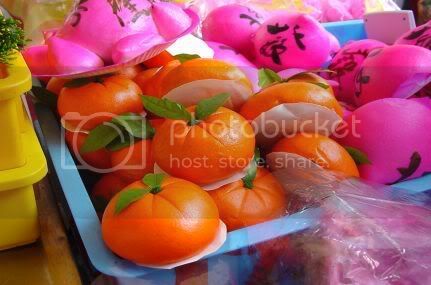 These buns shaped as mandarin oranges and peaches with chinese lettering are some of the food items offered to the hungry ghosts. 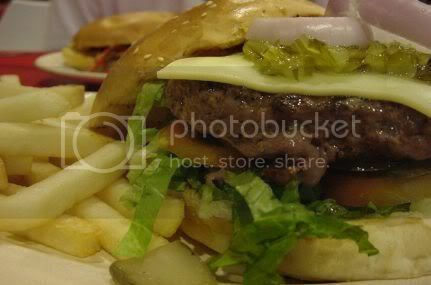 Lilian from Malaysia Best has blogged about another type of bun that is also offered to them. I am super late today in blogging this as it's been a day of all sorts of mishaps. Luckily I am home now and ready to finish this post I started this morning. The last time we were at Hartamas Shopping Center where we ate at Warung Aji-Don Alley, we spied this Flamin' J Firehouse. Hence when we decided to eat out last Friday, after the typical conversation of where ah?, what do you want to eat? questions, Splashie Boy decided we will give this place a try. I was a bit hesistant as I have not heard much about this place and the last time we walked past it, the restaurant was empty. Since I did not want to argue on a Friday night, I dutifully followed Splashie Boy to the restaurant and this time around, it was packed with people. There was a noisy group of people having an office party, some families and two Japanese men tucking into their fries looking really out of place in their suits. Although this place is Malaysian owned, food served here is American style with sandwiches, burgers, fish and chips, steaks and etc. What amused both of us was the menu had two different categories; US Size and Malaysian Size. A quick check with the waitress indicated that since some Malaysians were small eaters, they could opt for the lighter portion. Splashie Boy spied his favourite, the All Philly Cheesesteak Hero which he immediately ordered. He asked for lamb pieces in his sandwich and it came packed with it. This was served with potato crisps. It was yummy and quite filling as he ordered the US size portion. Although it cannot beat those American franchises like Chilis and TGIF, it's a real good effort by a local in cooking American style food. The prices are also reasonable and much cheaper than the franchises. I ordered a burger called the Big Bertha which was huge and came topped with a slice of cheese and pickles. The beef patty was yummy and juicy. My only complaint was the french fries could have been better as they did not taste home made and felt like the frozen ones you get from the supermarket. 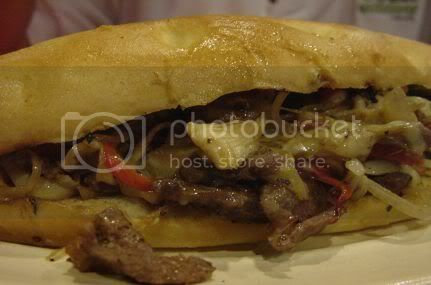 A quick look at the place also indicates that they have this challenge called Beat the Phyton where if you finish this gi-normous sandwich within an hour, your name will be recorded in the wall of shame at their outlet. Amazing stuff! 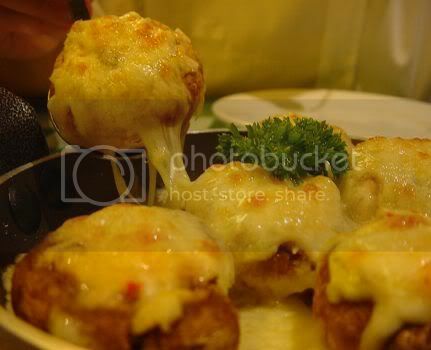 For more professional pictures of their menu items, do check Kevin Han's portfolio. 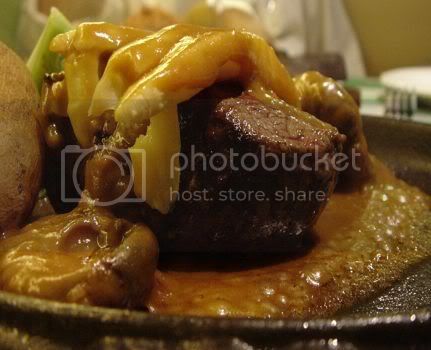 He has some amazing shots of the flame grilled steak and the Phyton. Also check his snails on top of the sandwich!? Incidentally, we also realised that this shopping center seems to be a US/Malaysia place as not only does it have a restaurant that serves the different sizes but when you pre-pay your car park ticket in the machine, you can also opt for US/Malaysian language. We made another trip to Hot Mama last weekend as we wanted to try the other things on the menu. This time round, we sat in the middle round table which offered less light so the pictures may be slightly dark. Not only did we have a wonderful meal, we both had tremendous fun. Contrary to popular belief, beauty queens do eat! These ones ordered huge bowls of noodles and piles of food. No desserts of course and once they finished, they were whisked away to touch up their make-up. They love the camera! Throughout their lunch, if it was not the official photographer taking pictures of them, they were clicking camera phones and digital cameras taking their own pictures. All of them look kinda alike; long straight hair, tall and skinny of course. A few stood out with short spiky hair or dyed brown hair. Uniform of the day was figure hugging white top with low slung jeans. Okay, enough about them, think we should concentrate on the food since that is what this blog is all about! Starters were Shrimp Bananarama, stuffed spring rolls with shrimp and two varieties of fruits, mango and banana. It was yummy. 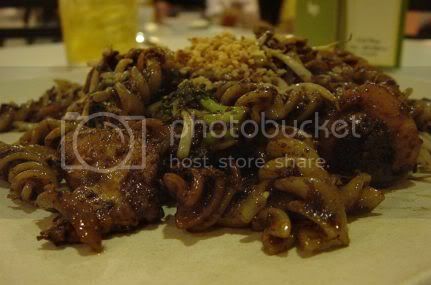 I had the Stir Fried Pasta which is like Hokkien Fried Noodles done with fusili pasta. There were chunks of chicken, prawns, brocolli, bean sprouts and lots of black soya sauce. This tasted oh so good! and I liked the sprinkling of chopped peanuts on top. Splashie Boy had the Roast Beef Set; pieces of tender roast beef with spices served with rice and a dipping sauce that made the dish. Although there were pieces of chilli padi in the sauce, it was not too spicy and tasted great with the beef. Here's a sneaky picture of the babes from our table. They're the girls in white with the sashes while the people in black is part of the beauty queen entourage. The chair is blocking the view but we thought, if we suddenly moved it that would have been too obvious. We finished off the lunch with the lotus pancake and ice-cream (as seen in my earlier blog). 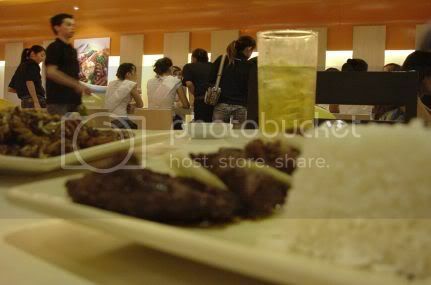 Last Saturday, Splashie Boy and the digital camera went for some fine dining at Med @ Marche, Renaissance Hotel courtesy of his office. The dinner was a thank you to all who helped make their recent company trip happen. I managed to persuade him to take the digital camera so we could share the yummy food he had that night. Med @ Marche is famous in Kuala Lumpur for serving Mediterranean food that is innovative. Currently helmed by Chef Joeri Schreurs, a culinary prodigy who helped opened the first Belgian restaurant in Hong Kong. Dinner was a fixed menu for approximately twenty people that night with two choices for each course. As everyone had confirmed their attendance, there were little namecards on the table to indicate where everyone would be sitting. To kick off the dinner, some started off with a button mushroom cappuccino. The other starter was the Marche Caesar Salad in Gentle Anchovy Dressing which Splashie Boy had. He liked it especially with the yummy sprinkling of grated parmesan cheese on top of the salad. 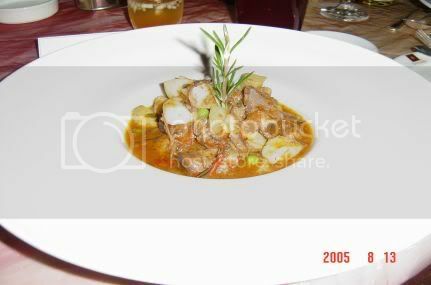 The main course was a choice between the Braised Lamb Shank served off the bone in Tomato-Bell Pepper Salsa served with Rosemary Flavoured Potatoes. Splashie Boy had this of course (lamb is his favourite!) and he loved the tender lamb. 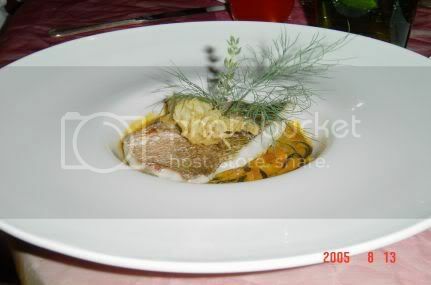 The second main course choice was Red Snapper on Black Ink Pasta with Red Vegetable Juices of the Highlands and arranged with Seafood Tempura. As Splashie Boy did not have this, not quite sure what it tasted like. Desserts were sinfully chocolate based. Splashie Boy had the Oven Baked Tortino with Melted Chocolate Center. 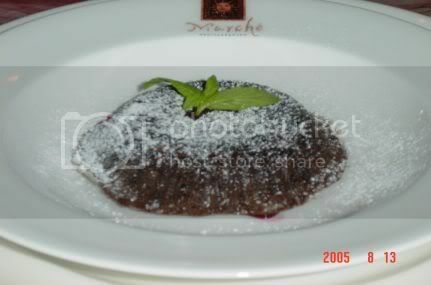 There was a tinge of raspberry sauce together with the melted chocolate so it was not too rich. Perfect for the end of a yummy dinner. 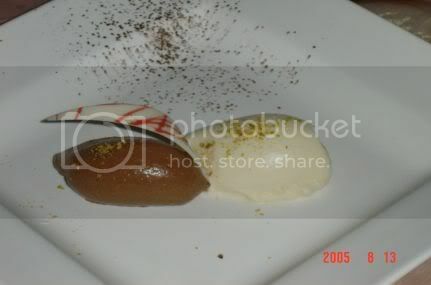 The second choice for dessert was the Duo of Callebaut Chocolate Mousse; a white and dark chocolate mousse. Dinner conversation at the table was sparkling, of course! Nothing on IT as that's work and oh so boring! but more on cars and tyres especially the finer points on how to differentiate between the Porsche models like the C2, C4 and the GT. After dinner, everyone adjourned to the Poppy Garden along Jalan P. Ramlee for a few drinks until it was time to go home. It's Monday (boo hoo hoo!) and before we start the week, head over to loveSicily to see the SHF 11 round-up for a well needed caffeine boost. Desserts and coffee never tasted and looked better. You also get an additional bonus of viewing wonderful sights of Sicily that will make you long for the holidays, far far away from work. It's weekend cat blogging again! If you want to join us, send me the link to your cats in the comments section and add the Weekend Cat Blogging tag on your post. 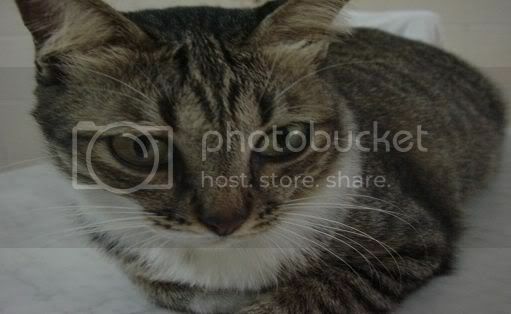 This weekend, I thought I'll share some pictures of Meow Meow, Boo's mother. I know her name is kinda lame but we started calling her that and she responds to that name all the time so we have never changed it. Her story is quite unique as we are not very sure about her origins since she turned up one day asking for food at my dad's house. My dad fed us scraps and everytime he was at home, Meow Meow will also be there. 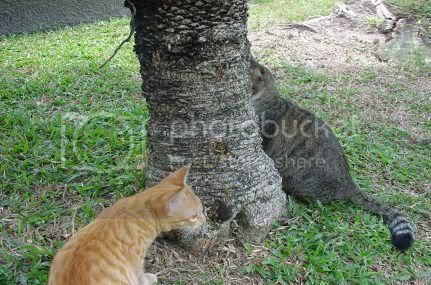 He suspected all the while, she was the neighbour's cat who came over for extra food. Then when my dad passed away, I took over looking after her and I even asked the neighbour if it was her cat but she denied it. She stays at my parents' old house in Petaling Jaya and we go over there daily to feed her. I doubt Mr. Iron Paw aka Kits will like it if I bring another cat home. However when we shift into a bigger house, we plan to reunite Boo and her mother. The funny thing about this cat is she will wander around the whole neighbourhood and stay at other people's houses. Everyone knows she's our cat as whenever we want to feed her, we will call and call her. I had to show you this extremely cute picture of her. She was sleeping so soundly on Friday that she did this pose in her sleep! Not sure if she was dreaming of doing some dance since she slept for a while with her paws up in the air. 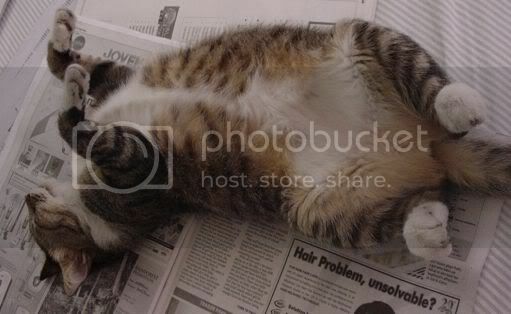 She loves newspapers hence she is sleeping on some. Her perpetual hobby is whenever I read my papers, she will jump on top of them and block me. Audrey from Belly Timber has graciously posed for us this weekend while Skor i Skralden joins us for the first time with a cute picture of her kitty cat. Then, we zip to Melbourne where Bella from A Few of My Favourite Things is in a party mood. Anne from Sweden shows us cute Edith who shares with us a bit of her tongue! A final stop in the USA reveals that Susan from Farmgirl Fare has a new cat in her cabin. More new additions to the fold; Callie from Sweetnicks (with her stash of yummy magazines) and the adorable Ingrid from Tigers and Strawberries. Kitchen Mage joins us with her two sleepy kitties who look like they got to the wine bottle.